This text is relevant to researchers and practitioners, engineers and chemists, working in corrosion in industry, government laboratories and academia. It is also suitable as a course text for engineering students as well as libraries related to chemical and chemical engineering institutes and research departments. Consulting in the fields of corrosion and corrosion control by inhibitors in sour gas systems, grinding balls, microbiological corrosion, corrosion of low-leaded copper-base alloys, hydrogen damage in high-strength and rail steels, galvanic corrosion of household plumbing solders and contamination of drinking water, surface quantification of corrosion products, electrochemical sensors for hydrogen in steels, reverse osmosis and water pollution and beneficiation of ores. Research Scientist and Group Leader/Corrosion & Protection at Natural Resources Canada, CANMET, Materials Technology Laboratory (MTL), Ottawa, Canada. Authority in hydrogen-induced cracking and material degradation in H2S environment; Coordinated complex and difficult tests on full-scale pipes in H2S environment for oil and gas industries; Provided critical technical information and consultative expertise to Canadian companies. 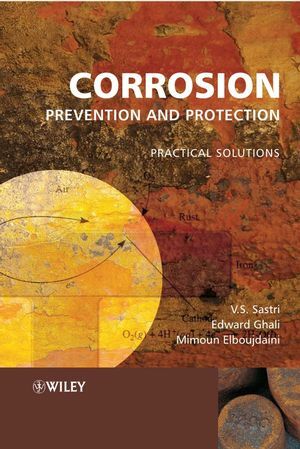 1 Introduction and Principles of Corrosion. 1.2 Preliminary Aspects of Thermodynamics and Kinetics. 1.3 Nature of Corrosion Reactions. 1.4 Oxidation and High-temperature Corrosion. 1.7 Life Prediction Analysis of Materials. 2 Corrosion Testing, Detection, Monitoring and Failure Analysis. 2.2 Corrosion Detection and Monitoring. 3 Regulations, Specifications and Safety. 4 Materials: Metals, Alloys, Steels and Plastics. 4.2 Carbon and Low-alloy Steels. 4.4 Aluminum and Aluminum Alloys. 4.5 Copper and Copper Alloys. 4.6 Nickel and its Alloys. 4.7 Titanium and its Alloys. 4.9 Lead and Lead Alloys. 4.10 Magnesium and Magnesium Alloys. 4.11 Zinc and Zinc Alloys. 4.12 Zirconium and its Alloys. 4.13 Tin and Tin Plate. 5 Corrosion Economics and Corrosion Management. 6 The Forms of Corrosion. 6.3 Active and Active–Passive Corrosion Behavior. 6.5 Types and Modes of Corrosion. 6.6 The Morphology of Corroded Materials. 7.1 Cathodic Protection of Water Mains. 7.2 Internal Corrosion of Aluminum Compressed Air Cylinders. 7.3 Some Common Failure Modes in Aircraft Structures. 7.4 Premature Failure of Tie Rods of a Suspension Bridge. 7.5 Corrosion and Lead Leaching of Domestic Hot and Cold Water Loops in a Building. 7.6 Cathodic Protection of Steel in Concrete. 7.7 Corrosion of Aluminum Components in the Glass Curtain Wall of a Building. 7.8 Corrosion in a Water Cooling System. 7.9 Pitting Corrosion of 90/10 Cupronickel Chiller Tubes. 7.10 Weld Metal Overlay: a Cost-effective Solution to High-temperature Corrosion and Wear Problems. 7.11 Equipment Cracking Failure Case Studies. 7.12 Failure of a Conveyor Drive Shaft. 7.13 Failure Analysis of Copper Pipe in a Sprinkler System. 7.14 Failure of Rock Bolts. 7.15 Failure Analysis of 316L Stainless Steel Tubing of a High-pressure Still Condenser. 7.16 Failure of a Landing Gear Steel Pin. 7.18 Micromechanisms of Liquid and Solid Metal-induced Embrittlement. 7.19 Nitrate SCC of Carbon Steel in the Heat Recovery Steam Generators of a Co-generation Plant. 7.20 Performance of Stainless Steel Rebar in Concrete. 7.21 Corrosion of an Oil Storage Tank. 7.22 Corrosion of a Carbon Steel Tank in a Phosphatizing Process. 7.23 Underground Corrosion of Water Pipes in Cities. 7.24 Corrosion in Drilling and Well Stimulation.